The Kennedy Center is no exception. Happily, Washington DC, as one of the nation’s wealthiest cities, is well positioned to support a robust arts community. REACH, the Kennedy Center’s ambitious expansion project, is an excellent example. As reported here, after the Kennedy Center rapidly met a $136 million fundraising goal, it raised the bar and promptly brought in another $50 million. Moreover, whereas the Washington National Opera and the Kennedy Center brought in nearly $150 million in earned and contributed income in 2000, by 2014, that total was nearly $250 million—a 66% increase. 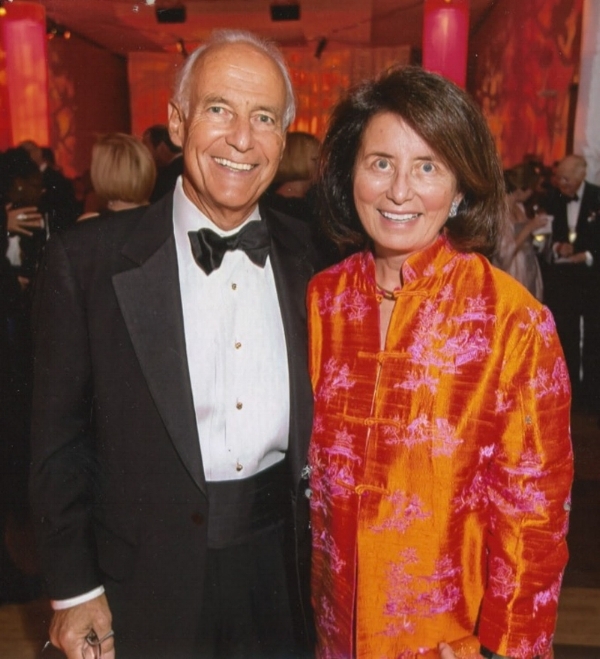 We thought we’d put a personal face on local cultural philanthropy by introducing you to a couple who have been generous and long standing friends to the WNO, as well as many other DC arts organizations, Bob and Jamie Craft. Please tell us about your background! Jamie grew up in New York City and Bob in the suburbs of New York. We moved from New York to Washington for what we thought would be two years in 1975. We are still here. Happily! Bob's career was with the law firm of Sullivan & Cromwell; Jamie was a real estate broker in New York and an interior decorator in our early days in Washington. We have two sons. One is an energy portfolio manager in London, and one is a James Beard Award-winning chef-owner of five restaurants in St. Louis, and one in Nashville. When we first moved to Washington, we rented an apartment in the Watergate and virtually lived at the Kennedy Center. To what do you attribute your passion for opera? Bob: I was introduced to opera when my college advisor wisely suggested I take a course entitled History of Opera. The Music Department also conducted a weekly drawing for tickets to the Metropolitan Opera and I was lucky enough to occasionally attend. One of these performances was on the night of March 4, 1960 when a sold-out crowd braved a snowstorm to hear Renata Tebaldi, making her first appearance at the Met in nearly a year, sing Leonora in La Forza del Destino with Richard Tucker, Leonard Warren, Jerome Hines, and Thomas Schippers conducting. The evening turned tragic. Warren, 49, was in fine voice, when toward the end of his Act III, Scene 2 aria (which begins, ironically, "Morir, tremenda cosa... "), he took several steps to his left and fell to the stage. He apparently died almost instantly of a cerebral hemorrhage. I am still shaken when I think about it. Martin Feinstein [former General Director of the WNO] told me that he too had been at the performance. Jamie: My passion for opera, and that is the right word for it, is directly linked to my passion for Bob Craft. He made me an opera fan. My mother took me to ballet, symphony and opera on a regular basis. Ballet made me a music lover, but it took Bob to make me an opera lover. Riding with him in a little Fiat, listening to Verdi, did the trick. It’s a good thing I did become a fan. If not, I would be spending many evenings alone! Do either of you have musical training? Jamie: Although I took piano lessons, I read music badly. But I spent a lot of time at the piano and can fake most I IV V melodies in C or F. I have a good musical memory. Bob: No musical training whatsoever. How many years have you been involved with WNO? Jamie: I began working for the Women's Committee of The Washington Opera in 1976. In those days we were a major fund-raising arm, running auctions, opera balls and anything else we could think of. Bob: I was on the Board from 1980 through 2006 and served as President from 1998-2002, soon after Placido Domingo became Artistic Director. I joined shortly after Martin Feinstein became General Director and also served as legal counsel. In the latter role, I would often get phone calls from Martin with a problem to be solved: "Bob, can you come right over?" The opportunity to work closely with Martin, who as an impresario had worked with the great Sol Hurok, was endlessly fascinating. As President, I worked closely with Placido Domingo—an experience I wouldn't trade for anything. In each case, Jamie and I also became friendly with their families. In 1982, I and several others formed The Lawyers' Committee, which put on an annual dinner featuring witty talks by Supreme Court Justices and performances by singers from the WNO. I appeared as a supernumerary in Tosca (once as a Bishop and once as the Cardinal), and in the world premier of Goya (as a beggar). We both appeared as supernumeraries in the opening performance of Ariadne auf Naxos with Justices Scalia and Ginsburg in 1994. Jamie: At an opera auction on WGMS, I bought Bob the opportunity to be a super the first time he did it. It was a BIG mistake. He really took to the smell of the greasepaint! You have been longtime supporters of WNO. Can you describe what motivates you, and why you feel that it is important to contribute? We love it! First you contribute because you love opera. Then, in our case, we started to love the people who make opera. We have been lucky to know so many people backstage over the years. Also, Washington has so many people here from other countries that we thought it important that Washington represent the country as a cultural center. It was not one when we arrived in 1975, but it certainly has become one. Like most people who support the WNO, we feel that we have gotten more out of the experience than we have given. Most of our closest friendships over the years in Washington have been made, in one way or another, through the WNO. Do you have any favorite concert-going memories? Do we have memories! How much space do you have? Bob: At the top of the list is WNO's Ring Cycle two years ago under Maestro Auguin. We attended three complete cycles (counting the dress rehearsals as one cycle) and I went to a fourth Gotterdammerung for good measure. When asked why I kept going back, I said: "To listen to the orchestra. Often I close my eyes and just listen. The orchestra was extraordinary. Absolutely world class." Another kind of opera-going memory involves last minute cancellations and substitutions: When Shirley Verrett canceled a performance of Tosca one afternoon in1982, Martin Feinstein tracked down Olivia Stapp in a bank branch in New York City about 3:00 pm. She hopped in a cab, swung by the Met to pick up a copy of the score, and caught the Eastern Air Lines shuttle (where they roped off the first two rows so she could vocalize). They sewed her into her costume shortly before the 7:00 pm curtain, which was briefly delayed—Martin Feinstein sent the audience out to the lobby to have a drink. She had not sung Tosca in 17 months, so a prompter's box was hurriedly set up and Cal Stewart Kellogg (who was conducting Falstaff that week) acted as a prompter; John Mauceri conducted. Jamie: Near the top of the list is the month in 1973 when we heard Gotterdammerung four times at the Met, three with Birgit Nilsson as Brunhilde. Nilsson had fallen off a tower at the dress rehearsal and was hospitalized with broken ribs just days before opening night, which we attended. We didn't know whether she would sing, but there was no announcement to the contrary. At her first appearance, the audience burst into a sustained roar-- a thrilling moment that I still remember vividly. She was glorious. Imagine singing Brunhilde with broken ribs. Do you regularly attend ballet and symphony as well? Jamie: For many years we stopped going to the symphony. I have ADD – I often fidget in the symphony. We started going again because we enjoyed Maestro Eschenbach’s concerts. He is an amazing musician. And we are loving Maestro Noseda’s concerts. We also try to attend performances by visiting orchestras whenever possible. Sometimes we get to the ballet—not often enough. Are there other arts organizations that you support and enjoy? Yes, and we would support them all if our pockets were deeper. We support Washington Concert Opera, WPAS, National Gallery of Art, and Opera Theatre of St. Louis, and we give smaller donations to many organizations. How often do you attend performances? We have heard nearly every opera performed by the WNO since arriving in Washington in 1975. If there are two casts, we often try to hear both, and we always try to hear the Young Artist performance, and dress rehearsals too. We traveled to Japan in June 2002 when the WNO presented Otello,Tosca and Sly. You seem to take an interest in the KCOHO and are familiar with many of our musicians. Bob: I first met members of the orchestra in 1991 when I helped negotiate the end to the orchestra strike, which had resulted in Don Carlo and Don Giovanni infamously being performed without orchestra (with only two pianos in the pit). It became clear to all, if it had not before, that the orchestra is essential to opera. I was involved in several negotiations in later years, working closely with Greg Drone and Frank Carnovale [KCOHO orchestra committee members] and the orchestra's counsel, Leonard Liebowitz. During the period when Heinz Fricke was Music Director, I frequently visited the orchestra backstage after a performance, occasionally enjoying beer brewed by Stephen Bates (and the gift of a hand-painted tie), and striking up acquaintances with many current members, including Amy Baumgarten, Adria Foster, Oleg Rylatko, David Jones, Igor Leschishin, Meg Thomas and others. Jamie and I both developed a close friendship with Maestro Auguin. We're always looking for ways to increase our connection to our audience. Do you have any thoughts about that? Bob: I would like to work with orchestra members to find ways for them to connect with audience and Board members, and to discuss it with Tim O'Leary, the incoming General Director, who I believe has an interest in this. Jamie: I want to add my gratitude that the Kennedy Center took on the WNO when it became clear it could not continue independently. Because of that, we continue to have the joy of opera in Washington. Bob and Jamie Craft: The musicians of the KCOHO thank you for your continued support and love of opera!